For the next entry in #MeikleMarch, I decided that I wanted to briefly move away from fiction that was earth-bound, and instead read something that was also set in the stars – something that put the action in space, instead of just on terra firma. 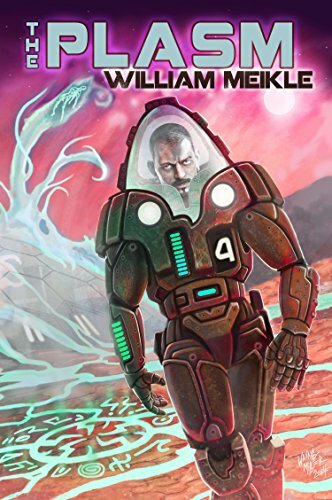 Fortunately for me, as Mr Meikle has been such a skilled and prolific writer, I knew he had just the title for me – The Plasm, again published by Dark Regions Press. Splitting the action between the deepest, darkest reaches of the solar system, and a secretive government storage facility on Mars, The Plasm is a taut, suspenseful and deeply atmospheric horror novella that illustrates that Lovecraftian horrors can just as easily extend their reach into the depths of the vacuum of space as remain on solid ground. The Plasm is in fact an expansion of one of Mr Meikle’s earlier short stories, When The Stars Are Right, which is actually integrated into the opening chapters of the novella; and concerns the sudden appearance of the Vorlak, an experimental spaceship which disappeared with all hands on its maiden voyage early in the 22nd Century. Nearly a century later, it suddenly appears in the flightpath of a small cargo ship that runs cargo between Earth and Mars. Hailing the mystery ship results in nothing but static, and despite its sudden appearance and lack of activity, greed overcomes an innate sense of fear and the two crewmembers decide to investigate, planning on claiming the vessel for salvage and retiring early from the proceeds. Unfortunately for them, and also for the occupants of Mars, it rapidly becomes apparent that the Vorlak is not as empty as it seems, and that catastrophe for humanity is only a few short steps away. Alternating chapters between an investigation of the Vorlak, and mysterious and interrelated events taking place in the government storage facility on Mars, the author slowly but surely cranks up the atmosphere (no pun intended) and the tension, as it slowly becomes obvious that the reappearance of the lost spaceship is not a coincidence, and is in fact related to how the Vorlak’s revolutionary and controversial engine system operated. The engine system is actually at the core of the mystery, and I think it must be one of the most imaginative takes on space propulsion that I’ve seen in a science-fiction scenario. The development of the technology, which is told in snippets from a scientist’s electronic journal (actually called tapes, in a delightful throwback to sci-fi adventures from the 1960s and 1970s) is both creative and terrifying, given the early costs associated with it, and even the supposed technological solution developed by the scientists has flaws which become obvious later on in the story. I greatly enjoyed the meshing together of science and occult craft employed in the story, and it’s an underused mechanic that I think more authors should employ, rather than using just one or the other. The writing is Mr Meikle’s usual very high quality, and he is able to effortlessly evoke two very different atmospheres, on Mars and on-board the Vorlak, including some short but sharp action scenes that demonstrate the ineffectiveness of mere human firepower on an occult being. I also appreciated that Mr Meikle keeps the ‘jargon’ to a minimum, instead focusing on the tension and horror to be invoked in both entwined scenarios; all too often novels set on spaceships try and load down the reader with technical terms and language in an attempt to seem realistic or immersive, only to achieve the very opposite. The Plasm doesn’t suffer from this, the author keeping the technology descriptions to a minimum and instead using that word count to further develop the oppressive and unsettling atmosphere that pervades the novella. The characters introduced in the story are also highly engaging, and the main cast of characters are well-developed and characterised, especially when the relatively small word-count is taken into account. I particularly enjoyed the appearances by Jake Royle, one of the guards of the storage facility who rapidly develops a pervasive sense of fatalism as a result of his contact with the mysterious entity that wreaks havoc in and around the facility. Accompanied by an extremely evocative and suitably menacing piece of cover art by the redoubtable M. Wayne Miller, The Plasm is a fantastic piece of science-fiction horror writing that is reminiscent of one of my favourite films – Event Horizon – that I greatly enjoyed, and would encourage anyone with an interest in horror or science-fiction to pick up as soon as possible.